Fans of the Aliens and Predator movies, who also have a fondness for scale models will be in heaven with the latest promotion from Eaglemoss. 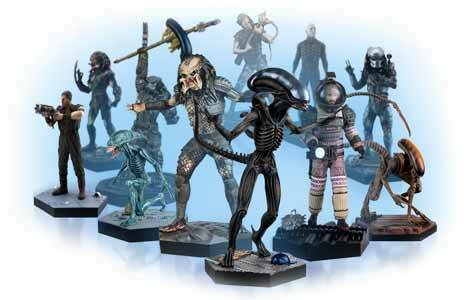 The Alien & Predator Figurine Collection acts as a subscription service where you pay £9.99 to start your collection, whereby you receive the Alien Xenomorph model. Then every month you pay £21.97 (£17.99 + £3.99 P&P) to receive another two figures. The subscription can be cancelled at any time, but you are also offered free gifts (worth £75) along the way. With shipment 3 you'll receive a tin box and movie prints worth £15; With shipment 5 you'll get an exclusive T-shirt worth £15; and with shipment 10 you'll earn yourself a model Alien Egg and Facehugger worth £45. 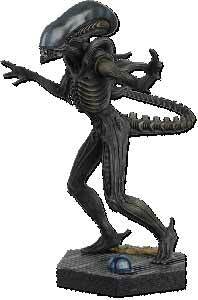 The first figure in the collection is the terrifying Xenomorph from Alien (1979). The figure, like all in the series, is hand painted in stunning detail. It's a 1:16 scale model (roughly 14cm tall) and comes in a plastic bubble pack that means it's pretty robust to be sent through the post in even the flimsiest of packaging. Ours arrived in a large jiffy bag and the box and packaging were in perfect condition. It also includes a leaflet which gives you a little more info on the Xenomorph from the movie as well as giving you a taster of some of the future figures in the collection. The detailing on the figure is pretty impressive and is sure to take pride of place on any collector's display cabinet. It looks like the series will run for 10 months offering you 11 figures in total. So this won't see you run up a huge debt nor will it see your shelves swamped with figurines. It's the perfect amount. 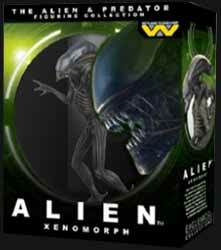 If you're a fan of collectable figures and love Alien and Predator then this is an essential collection for you.